The sky was remarkably clear upon waking at Jerry’s Cabin. Unfortunately it wasn’t meant to last. A thick and heavy fog quickly rolled in as I was heading out behind Blaise and the gang. Fortunately the climb out wasn’t too bad and before long I had a decision to make. 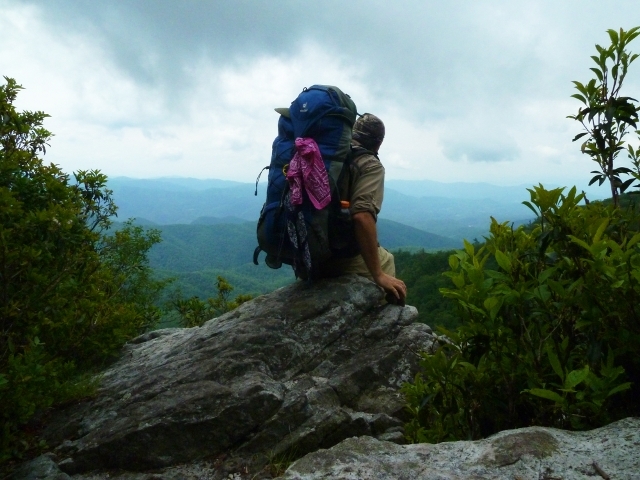 After passing the Round Knob Trail, the AT splits at the Firescald bypass. 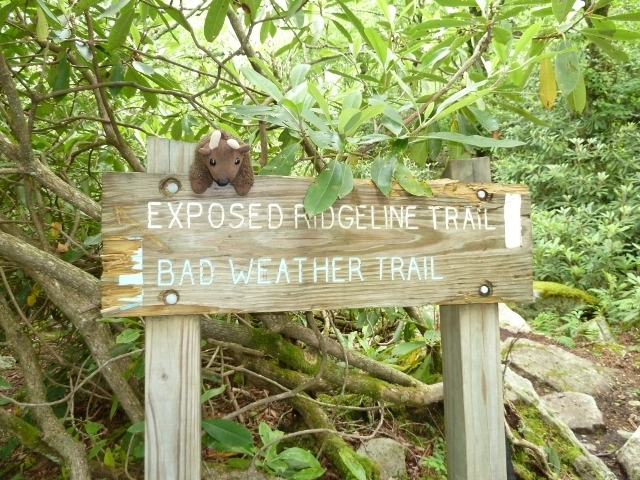 The AT continues on along the Exposed Ridge Trail but if inclement weather is in the forecast you may choose to take the blue-blazed Bad Weather Trail. 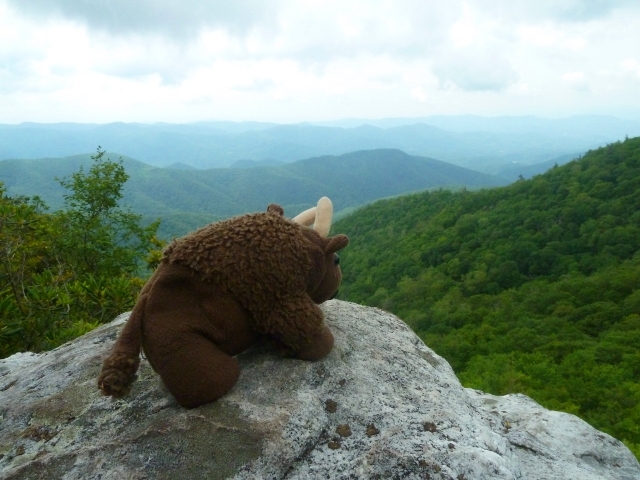 I decided to follow the white blazes and headed up the steep and rocky incline. This is when I decided I’d certainly made the right decision about stopping at Jerry’s Cabin and not attempting this section while tired and daylight was fading. As I made my way along the rock scrambles the wind picked up and buffeted me with a chill. 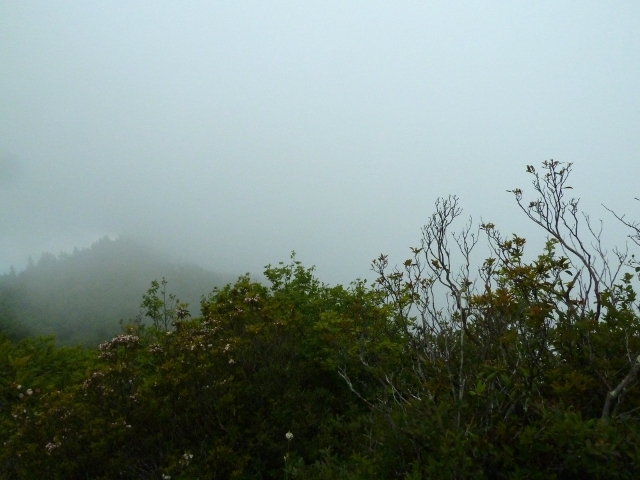 Though early in the morning my clothing was already wet with sweat and the wind and fog deepened the cold. I traversed Big Firescald Knob and Bearwallow Gap before making a short and very muddy climb to Blackstack Cliffs. One and a half miles later the Exposed Ridge and Bad Weather trails reconnected and I took a quick break. I was very disappointed that the fog obscured most every aspect of the view other than what was immediately in front of me. A short way down the trail I decided to try my luck again at Whiterock Cliff. The weather in the valley had cleared considerably facing east and my views were much better. I have to admit, though, that it was pretty cool to watch the fog dancing and swirling as it blew between the mountains. 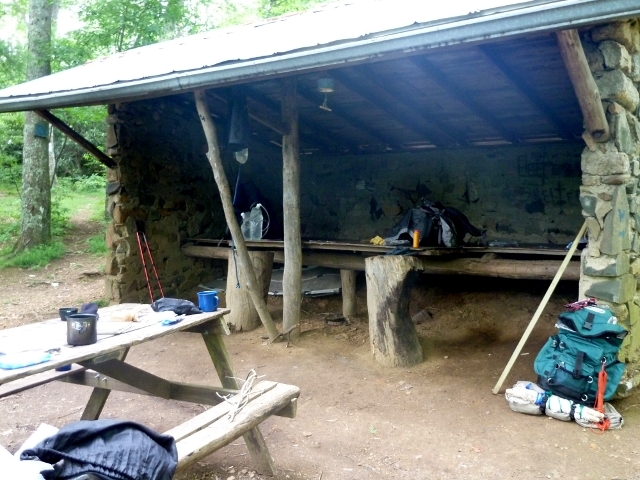 A few miles later I found myself at Little Laurel Shelter with northbound hikers like Delta Force. Oddly enough, Delta Force is a young woman who isn’t in the military nor in the famed special operations unit. However, she is the daughter of a retired Air Force member and actually grew up in San Antonio so we had something in common. I was hoping that I’d meet the Blaise gang but Delta told me I’d just missed them. I pushed on towards the next stop. 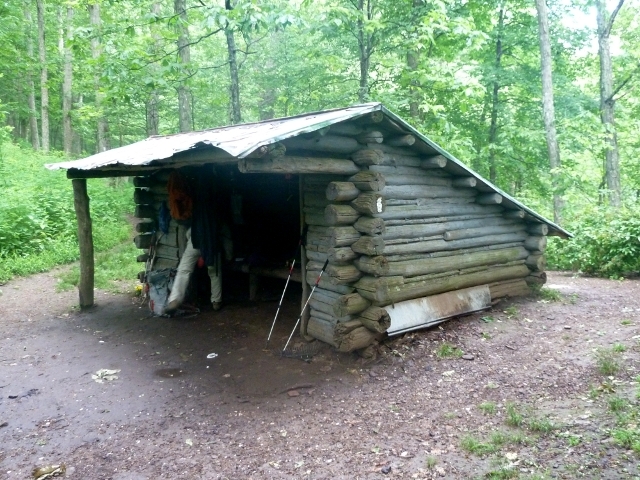 A few short miles past Little Laurel is Log Cabin Drive. As I was hiking down I passed a lone woman who didn’t look the least bit like a hiker. She asked if I’d seen a group of kids that were from a nearby church campsite. I hadn’t seen anyone in a while. I left her as she continued searching. 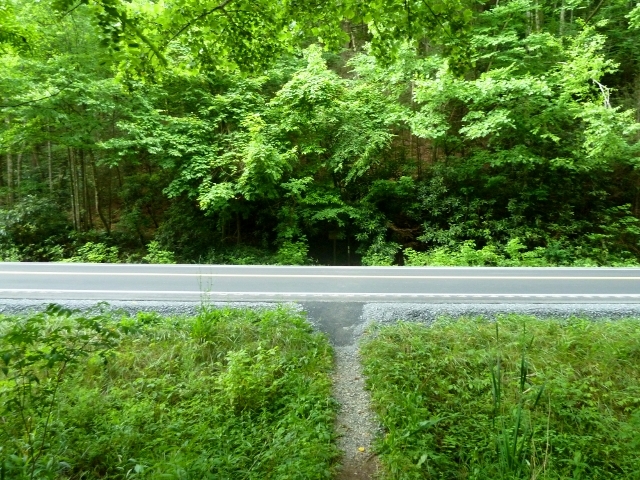 I reached Log Cabin Drive and never saw a side trail that she might have missed. Then I started wondering if she were real. 🙂 Part of my mind wondered if perhaps she was a ghost. Maybe she had died there years ago looking for this church group and now she spends eternity wandering the trail. It wasn’t long before my ghost reappeared and I realized that she wasn’t my imagination. Her friends drove up looking for her and took her on to the camp. 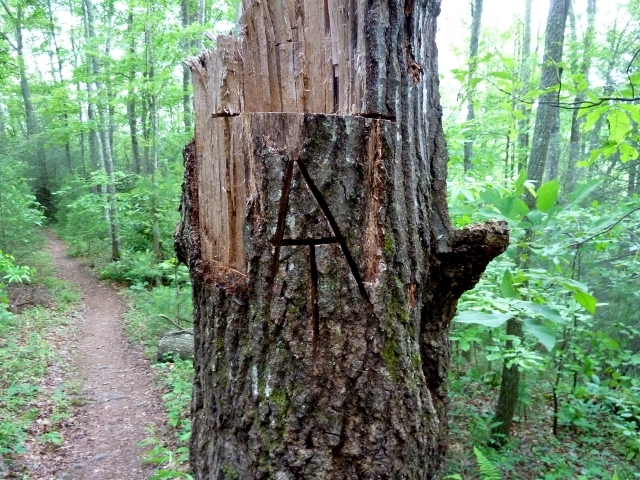 I never did figure out where the trail was. 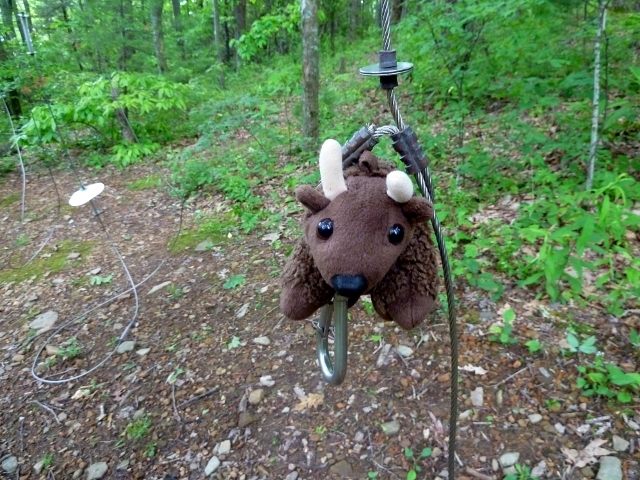 The gang had been hiking a lot longer than I had and had decided to bail for a day of rest at the Hemlock Hollow Inn. I hoped I’d see them again but I knew they were getting off the trail in Hot Springs. 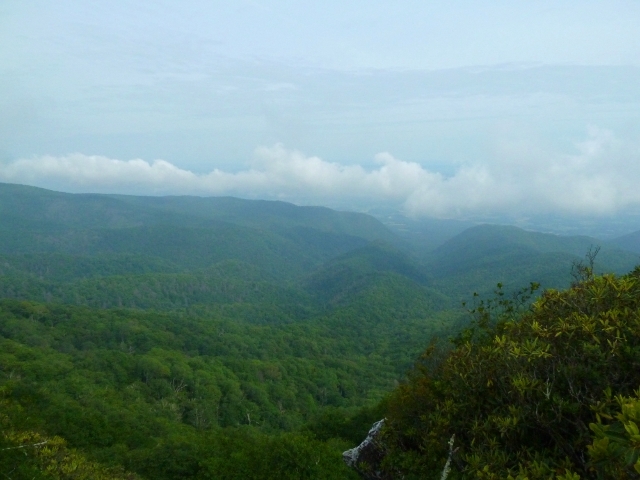 The climb out of Allen Gap wasn’t particularly bad and any hateful parts were short-lived. Water along the trail was plentiful and I was able to stay well hydrated. Despite the foggy start to the morning the day cleared up nicely. Since the first day put me behind I needed a big push to get back on schedule. I had a little over 15 miles to make it to the next shelter. I kept praying that the weather would hold but I found myself getting tired and slowing down which made me more and more concerned. 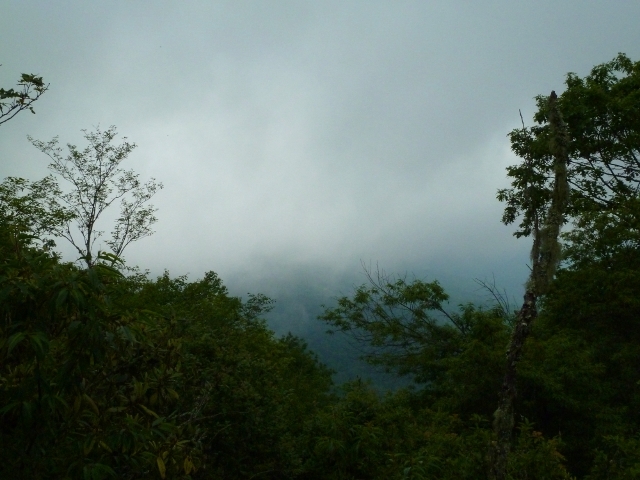 My concern was soon a reality is the rain began to fall with a little less than two miles to the shelter. Much to my chagrin I donned my rain gear again and plodded onward. I arrived at the shelter in a full downpour. My clothing and boots were soaked and the shelter was full so escaping into it wasn’t a possibility. I set about putting up the tarp and hammock but I wasn’t in a particular rush. It had been raining on me for a couple of hours. What were a few more minutes? Completely drenched and well chilled I changed into some dry clothes and headed to the shelter where they graciously cleared space for me to cook and rest. The whole latter part of the day I couldn’t get the thought of hot spaghetti out of my mind. I knew it would do well to chase the chill from my body but it wasn’t meant to be. I don’t know why but it just didn’t taste right. Maybe it was the new sauce I used. Perhaps it was the olive oil I added for a calorie boost. Whatever the reason it was a huge disappointment. It warmed the body but not the palate. The water source at Spring Mountain Shelter was a disappointment. While there was a pipe in place it wasn’t what I would call a “piped” spring. The pipe was simply providing a way to direct the water. Unfortunately the trail went directly through the water source so who knows how many people had been traipsing through it. Pre-filtering was certainly a requirement. The privy was a longer walk than I’d like especially when working my way through high, wet grass but it was in decent shape. The cables are up the approach trail about 20 yards. 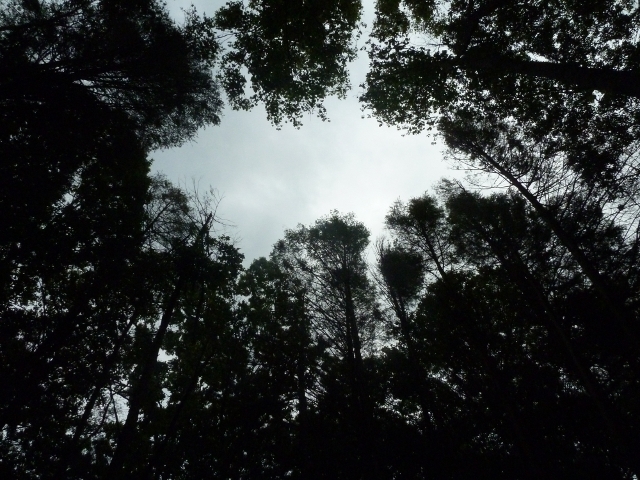 I crawled into my hammock early and quickly drifted off to sleep to the sound of raindrops bouncing off my tarp. It was a sound that would continue all night long as the rain never abated. I didn’t sleep completely peacefully, however. I never caught his name but there was a hiker in a horrible state. He found himself outside 4-5 times throughout the night either puking or dry heaving. I really felt for him. I never learned what caused the problems but his friends seemed to think he’d survive. I hope they were right. 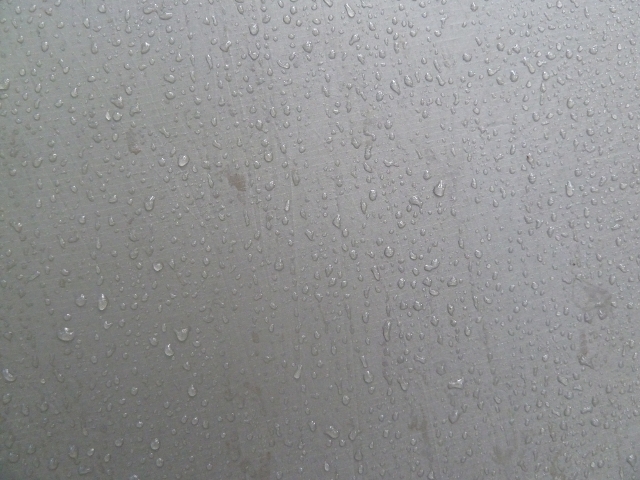 I awoke to a very damp morning and knew that nothing would be dry. Sure enough my boots and clothes were still completely soaked. I decided to put them back on, though, instead of staying in my dry clothes. I felt it was more important to have something dry to change into at the end of the day. Next stop…Hot Springs and a resupply!